Doug Menuez gained unprecedented, exclusive access to document the leading innovators of Silicon Valley during the Digital Revolution between 1985–2000 as they invented the technology that changed our world forever. Because Steve Jobs trusted Menuez, everyone did, and he was allowed to photograph daily life, capturing a hidden tribe and the unruly process of developing new technology in their secret R&D labs, board rooms, homes and private jets. Menuez will share selected images from his 250,000 image archive now housed at Stanford University Library, including images from his exhibit that is now touring the world, along with his eye-witness stories of the intense struggle to achieve the impossible. He chronicled the high-risk decisions, tragic costs and triumphant joy of the mind-boggling success. There are valuable lessons to be learned from this era of explosive growth and innovation that are relevant to today’s generation of entrepreneurs as they attempt to usher in the next technology revolution. All images above © Doug Menuez / Stanford University Library / Contour by Getty Images. For fifteen years I documented the efforts of a secretive tribe of engineers, entrepreneurs, and venture capitalists in Silicon Valley as they created technology that would change our culture, our behavior and challenge what it means to be human. My project began in 1985 when Steve Jobs was forced out of Apple and began his quest for redemption by attempting to build a super computer for education. Steve represented the freewheeling sensibility of the times, combining his idealistic, hippie vision and design aesthetic with the space-race ambitions of the prior generation. 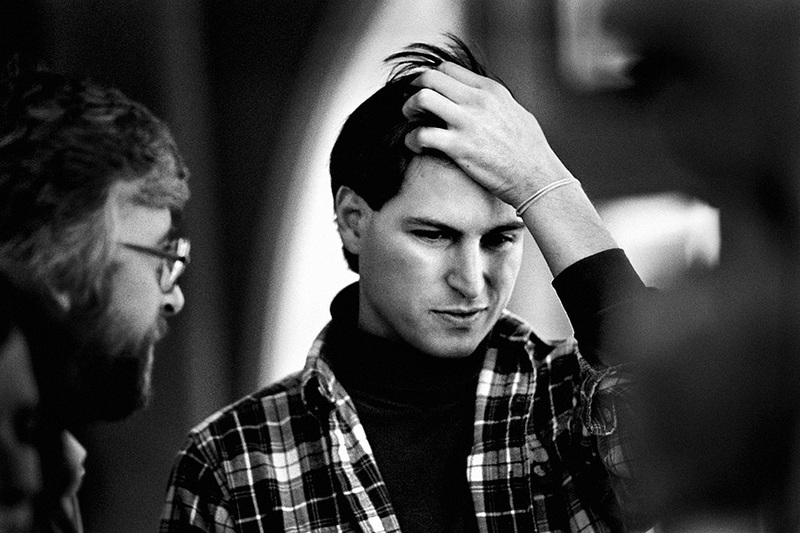 I wanted to understand his process of innovation and believed that by photographing Steve I could also gain insights into the larger subject of Silicon Valley itself. I requested special access to shadow Steve and his team and he immediately agreed. After three years, I expanded my project, gaining the trust and private access to every major innovator and over seventy companies, often for years at a time. I continued shooting through the rise of the internet and dot-com boom of the 1990’s, generating 250,000 negatives over the life of the project. During this era, the accelerating pace of innovation was affecting the very nature of work, the structure of corporations and the global business environment as whole countries began manufacturing new technology. A digital revolution was underway that would create more jobs and wealth than at any time in human history. Primarily, I needed to understand how Silicon Valley innovators fit into the context of my work. I explore the human experience of individuals as they attempt to achieve the impossible, overcoming fear and limitations. I’m curious about what motivates some people to rise against insurmountable obstacles and find meaning in their lives, while others simply cannot engage. Steve Jobs was again attempting to change the world with his team–to achieve the impossible–by fitting the power of a mainframe into a one-foot cube. Steve told me he hoped a kid at Stanford could use it to cure cancer in his dorm room. Because he believed this was possible, his team also believed, and his pursuit became a noble mission. I began to see that technologists were like any other human beings working to overcome adversity. Except if they succeeded, all humanity might benefit. I wanted to show the daily lives of the engineers, capturing moments of interaction and also to interpret the work environment, which was ostensibly dehumanizing. I sought to capture the context of this environment, looking for patterns of human behavior and emotion. I paid particular attention to any exhibition of stress, which increased over the years. This was in contrast to the public face projected by tech companies, which tends to be a polished veneer of extreme competence. An early perception was that the tech world was building machines that would erase human imperfection. They seemed anti-human in nature. But when Macintosh appeared a new path opened. Doug Englebart’s humanist vision, first posited in the 1950’s, was invoked by the Mac’s user-friendly interface. Englebart believed that computers should augment our brains, as opposed to the idea that sentient machines would replace our brains with Defense Department funded Artificial Intelligence. A subtle but crucial debate had begun in the Valley. I included a consideration for the moral and practical questions being raised. Choices were being made for us about how computers would evolve that might ultimately impact the future of the human race. The title Fearless Genius refers to those I observed who had true intellectual genius, usually in math or science, or a kind of genius, combined with a rare ability to fearlessly pursue the power of their ideas to fruition or failure, risking everything they had–their health, sanity, families, jobs– in the process. All wore their workaholic, hundred hour weeks as a badge of honor; no sacrifice was too high to “change everything.” Marriages dissolved, mothers raised their babies in the labs they never left, programmers went insane, and one young programmer I knew committed suicide. Some went to jail for fraud, others had lives ruined by collapsing companies, and a few died in flaming car crashes. And billions of dollars were made. The tremendous human cost of new technology development was not well understood. By 1999, the early idealism I witnessed turned to unsustainable greed and the dot-com bubble began to collapse. It was the end of a singular era, marked as much by technical breakthroughs as the shift from strong “we want to change the world” idealism to making money. Everything became centered around shares and cashing in on IPOs for companies with products not yet profitable, or in some cases that did not even exist. As the passion to invent gave way to a vague cynicism, I decided to end my project and put my negatives in storage. In 2004, Stanford University Library acquired my archive. While this work can never be definitive, my journey through the Valley coincided with a pivotal age, and includes almost every significant leader. To date, approximately 7000 images have been scanned, from which the selection of images presented here were chosen. After I retouched the files, they were output to digital negatives and printed by hand on traditional silver gelatin paper. I want to foster a dialog around what lessons can be learned from the era I documented. Since 2000, there has not been a single technology innovation in the United States that has scaled up to create millions of jobs as personal computers did. Facebook, Twitter, Google and others combined have added only 50,000 jobs and are basically software iterations built on work done in the digital revolution. Creating jobs is a global issue. But here in the US the economy is hollowed out, and our educational system seems broken. We’ve graduated fewer Doctorates in Computer Science this year than 1970. We’ve also cut visas for foreign workers and students, further limiting our ability to innovate. Kids today cannot imagine a world without texting, email or life online. They embrace all the newest digital technology but don’t understand where it came from. How did the pioneers of Silicon Valley achieve their staggering success? How can we inspire the next generation of engineers and inventors? Who will be the next Steve Jobs? Beneath the vast enterprise and all the PR hype I saw through my project, I discovered the joyful, primal urge to invent tools that has driven human progress for millennia. I saw something uncontrollable, hungry and wild–something human–that yet remains in Silicon Valley, with hope for a new technology revolution that can fulfill the promises of the last one. Doug Menuez began his varied career in 1981 as a photojournalist at the Washington Post, then as a freelancer for Time, Newsweek, Life, Fortune, The New York Times Magazine and many other publications worldwide. He documented the Ethiopian famine, the Olympics, and the AIDS crisis. He gained unprecedented access to record the rise of Silicon Valley and its most brilliant innovators, including Steve Jobs, Bill Gates, and John Doerr. Menuez’ work has won numerous awards such as The Epson Creativity Award, and has been exhibited in solo and group shows and featured in nine of the bestselling Day in the Life books, and on the cover of Day in the Life of Africa. Menuez’ advertising campaigns for global brands include Chevrolet, Nikon, GE, Emirates Airlines, Coca Cola, Chevron, and Microsoft. Menuez co-produced the bestseller, 15 Seconds: The Great San Francisco Earthquake of 1989, with David Elliot Cohen, which generated more than five hundred thousand dollars in relief money for earthquake victims. His recent book Transcendent Spirit: The Orphans of Uganda from 2008, with an introduction by Dame Elizabeth Taylor, raised over one hundred thousand dollars for Ugandan AIDS orphans. Stanford University Library acquired his extensive archive of over 1 million photographs and created the Douglas Menuez Collection at Stanford University Library. His current project, Fearless Genius: The Digital Revolution in Silicon Valley 1985-2000 was exhibited at the Moscow Photobiennale 2012 and then traveled to the 9th China Photographic Arts Festival, Visa Pour L’Image photojournalism festival in Perpignan, France, and back to China for Lianzhou Foto 2012. In 2013, the project travels to the Fundación Photographic Social Vision, Barcelona, Spain, then on to Shenzhen, China, Tokyo, Japan, and Winterthur, Switzerland for solo exhibitions.